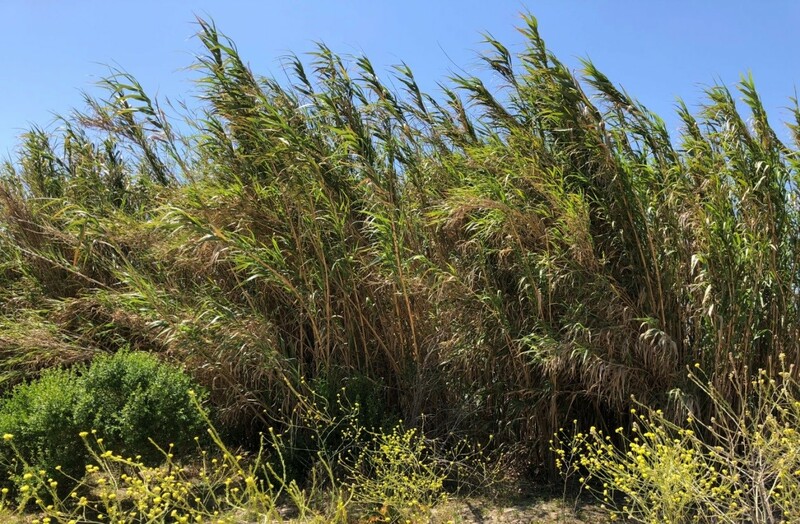 The Resource Conservation District of Monterey County (RCD) has been awarded a $2.9 million grant from the California Wildlife Conservation Board (WCB) for Phase IV of their Salinas River Arundo Eradication Program. The funding will go towards controlling 215 acres of Arundo donax, an invasive nonnative bamboo-like plant that has infested over 1500 acres of the Salinas River. The award leverages another $1.7 million awarded by the USDA to the RCD last year for arundo control. Arundo grows in dense stands along the river, crowding out native vegetation and creating a flood hazard to adjacent cities and farmland. Arundo also consumes huge amounts of water, leaving less water available for fish, wildlife, and farmers. The funding comes from the Proposition 1 Water Bond, which was approved by California voters in 2014. WCB awards Prop 1 funds through the Stream Flow Enhancement Program. This is the second award the RCD has received from Prop 1 funds, and the third award from WCB since 2014. The RCD currently has 500 acres of arundo under continued treatment between San Ardo and Soledad under these and other funding sources, including over $400 thousand from the Monterey County Agricultural Commissioner. Executive Director Paul Robins attended the WCB meeting in Sacramento last Thursday to thank the Board in person and respond to any questions about the long-term program and partnership prior to their final vote on the subject. ”We’re grateful for the WCB’s consistent investment in the improvement of the Salinas River. We’re fortunate to have such abundant support for such critical work,” commented Robins. Work under the grant will begin this summer and will include mowing 130 acres of arundo between Soledad and Gonzales. Mowing reduces the biomass of tall, dense arundo stands, which facilitates herbicide treatments in subsequent years. Under this grant, a total of 215 acres of arundo will be treated. Because the property along the river is almost entirely privately-held, the RCD must secure permission from individual landowners and farmers to conduct the work. ”Fortunately, there’s no love lost on arundo by pretty much anyone on the river,” according to Robins. The RCD of Monterey County was established in 1942 as a non-regulatory special local district guided by a board of directors. The mission of the RCD is to conserve and improve natural resources, integrating the demand for environmental quality with the needs of agricultural and urban users. In addition to conducting vegetation management on the Salinas River, the RCD assists farmers with irrigation and nutrient management, erosion control, and other services.